We are a bunch of people who got to know each other as fellow users of the Acknex game engine. After a lot of exchange on the Acknex boards for several years we finally decided to meet and present our projects in 2009. 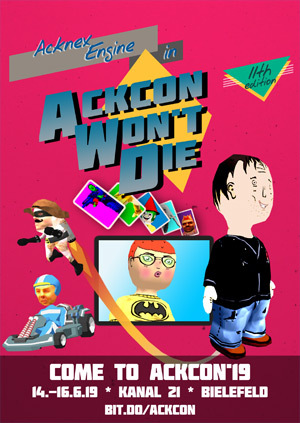 AckCon was born. From 2012 on we started focusing on a party coded weekend project making fun of the Acknex lead developer ("jcl"), as presentations became less with every year. The event turned out to be even more fun this way and we infected more and more people since. With more advanced game engines showing up on the market, people went different ways. Some of us are making games for a living now, others still work on hobby projects with different game engines, and a few of us completely left the scene to go for serious business. But for one weekend every year, we are all back - firing up good old MED, SED, WED and acknexing all day and night. This the prequel to our last year release. This time we prepared a challenging first person shooter for you. Enjoy! "You, Star Lotti, find the USS Patchnotes floating in space sending a distress signal. You decide to help the USS Patchnotes and enter their ship." This tiny story lets us appear as lazy bunch of people, but soon enough you'll find out the story develops while playing the game. Starlotti only needed an initial trigger to get him going. The release took way longer than initially planned, but we had so many great ideas in mind we didn't quite want to drop. Since we are celebrating our 10th anniversary this year, we decided to go for the full thing! Lotter vs The World Vol.2 ranked 3rd in Evoke Interactive Compo! Please check readme.txt for brief control instructions. 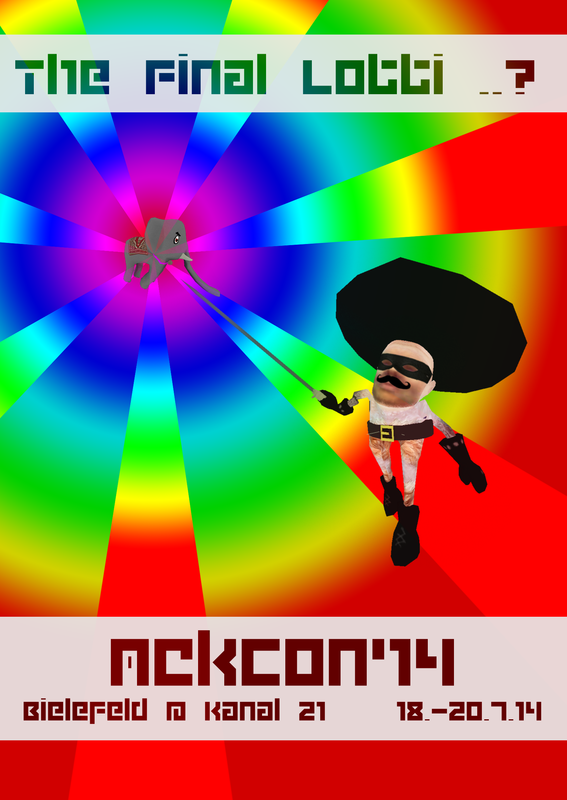 We present our first roguedislike action shooter with randomly generated levels. Have fun! There was nothing we could do. One by one they assimilated us, made us one of them. Made us fight our brothers and sisters. Until none but a few of us were left. In a last ditch effort to defend our home from these foreign invaders we executed a long forgotten program in unallocated memory space. By adapting the code of seven of our bravest fighters, it changed them, converted them into a force that not even the Unity could stop. The Guardians took control of the APIs and stopped anyone from entering or leaving their domain. Their memory space. It stopped the Unity, but without any means of escape those of us that were left also fell into the hands of the Unity. Until one day a new program appeared in the system, fighting the Unity. He is our only hope. It's him or them. It's Lotter versus the world. 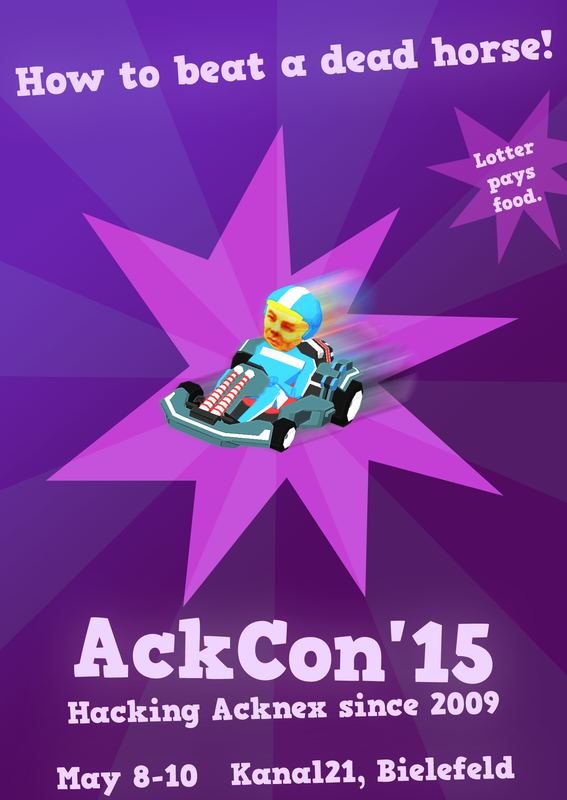 Minimistic AckCon! This time we were just five people attending the con, but still we tried our very best to deliver an acknexciting game for your pleasure. "Message from JCL, priority one! We need your help Star Lotti! The Unity Union has declared war and stolen one of our GALEPs. Our security guard is not enough to track them down. Go and bring it back!" Your mission is to find the magic GALEP device hidden somewhere in the Deathstone before running out of energy and time. Collect useful items, shoot enemies and avoid traps on this mind twisting ride through space. 2015/2 - Outsourced to Devmania! 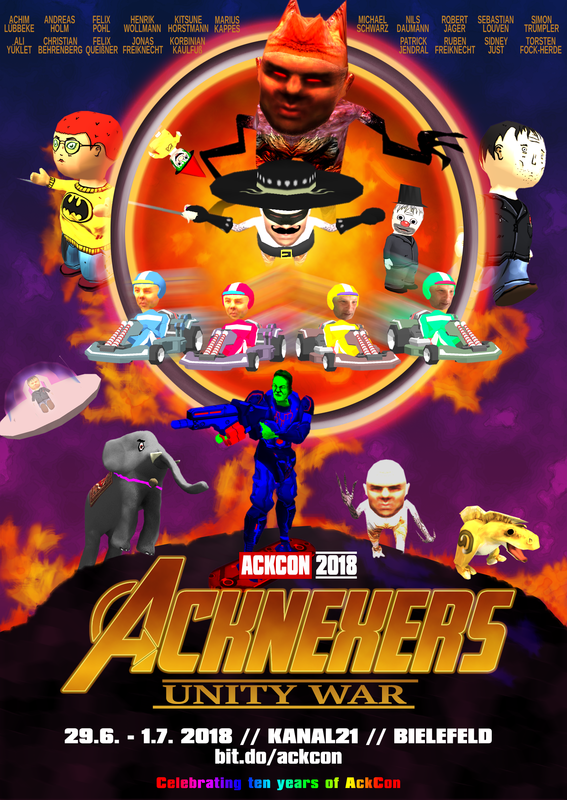 This time a small team of fellow AckConners visited another convention. Devmania in Mainz was just as much fun as every AckCon was, and we made a great 4th place in the "Winter Dream" themed overnight gamejam. The guardian of the hut one more time had some issues with his home goblins. At some point he only wanted to have silence in his wooden house, and being in a cold fury he simply threw out all the former helpful goblins. Since then the goblins are coming back to haunt his his wooden hut every night. They are trying to steal all wood billets, so the warming fire cannot continue to burn and silence will come back to the woods. Your task as hut guardian is to collect wood billets for the chimney fire and snowballs as ammunition during day. At night, linger on top of the roof, take goblins into target and smash them with snowballs. Never ever let the cosy warming fire extinguish! 2015 - How to beat a dead horse! Mike Morbius is facing a brand new detective adventure taking place in the LOTTERVERSE of Frankfurt/M. A series of murders has struck the city of Frankfurt. In parallel, Mike Morbius, a privat detective gets assigned a new case: the Utopia Conspiracy. What is going on with Utopia? Is there any relation to the murders? Only Mike Morbius can find out. Morbius was a setup as very ambitious project with a lot of ideas and many assets. While we tried our very best to build a party release, we had to accept that the project grew too big. So we finished it in our free time step by step until we had a nice playable version. We were even able to integrate additional feature - and finally also the voice acting is complete. We party. Hard. 2014 - The final Lotti..? Is this really the final Lotti!? JCL a.k.a. Lotti is racing... racing against time. Wallowing in nostalgia, collecting Acknex3 boxes, getting hold of precious Acknex4 cubes, throwing graves and other weapons at competitors he finds himself taking part at a fun racer developed in a single weekend by just 12 people. 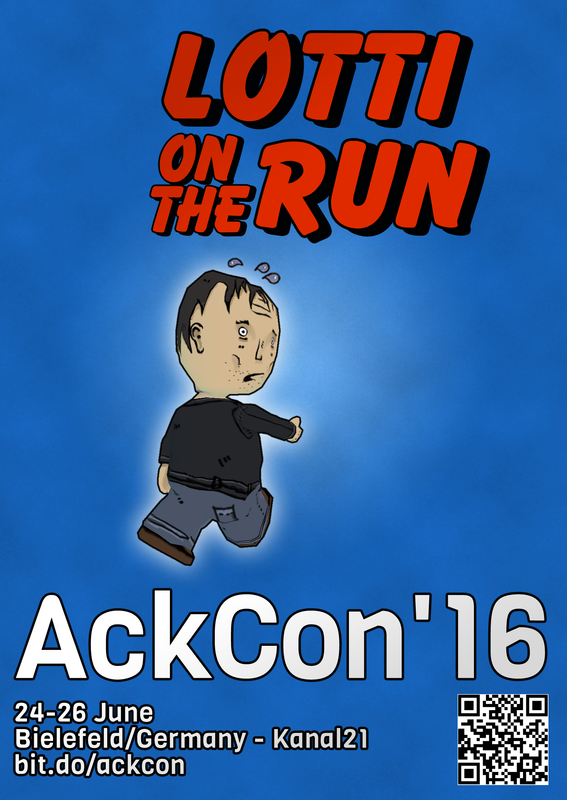 This year, we took our AckCon project to a new quality level. Don't forget to check out the contest release! We packed the source code to the download - only for you. 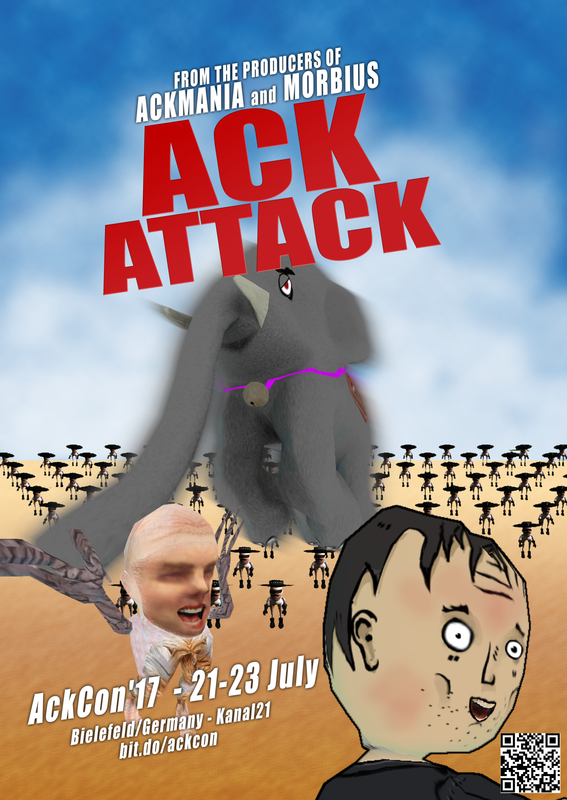 Acknex may have become Deadnex, but this cannot stop our passion for delivering crazy weekend projects solely for your pleasure. In order to protect his identity, JCL dons the disguise of Zorrotto. A fearless crimefighter by night, developer by day. Unfortunately most of his clones are on assignment, so he only has limited tries stepping into pitfalls before he has to give up. These are his adventures in Prince of Lotteria! This year's AckCon release turned out as a challenging and fun 2D platformer consisting of two different levels. Help JCL find his way beyond spikes, through simmering lava pools and crackling platforms. Always beware of falling rocks and nasty Acknex guards! For your further entertainment, the source code is included in the download. Two days full of rain. A strong team of active as well as former Acknexers. One crazy idea to unite them all. The Acknex engine is about to die once again! JCL (note: Acknex engine lead developer) does not have the time to keep up with all the competitors, so it's up to us to help him to code new parts of the engine. Type all the listings as accurate as possible before the time runs out in order to rise JCL's popularity level. The more popular he gets, the more freaky party will show up on screen. A proper Lottery shall always have a good portion of eye cancer packaged for free. This small project was created just within a few hours during night by only three people. Jcl has to collect Lite-C bulbs and engine bugs while avoiding bugfixes and new Unity engine features. Several famous hillarious quotes made by him in the Acknex forums can be found in the level. The completely overdone colors and shader effects were added with intention - of course. This game does not have any ending and will run until the player exits. Music Catch that Goblin was borrowed from Skaven. A7ntistress was created by Torsten as he was not able to bring his own PC and at some point late at night got a bit bored. Before releasing this game to the public, it was made sure that the Acknex engine lead developer (Johann Christian Lotter) agreed. Infinite Lottery Adventures was created by Michael pretty much due to the same reasons. This small jump'n run game became known as our first Lottery ever and got the gamejam tradition started. Eselslerche was supposed to become a small test level utilizing already existing assets rendered with different game engines. However, while people pretty much lost interest in the original idea right away, the Acknex version happily started evolving. It suddenly turned into some fun playground making the eselslerche model burp and fart when eating red flowers.